Well . . . this is the first time I’ve attempted to watercolor hounds, and I must say it’s giving me quite a challenge. I spend more time staring at the photographs than painting. The foreshortening is always a problem for me, but more than that, the trick of making predominantly white hounds emerge from a sunwashed dusty trail often leaves me scratching my head. I am enjoying the challenge, and hope all will end well. I have considerable time invested in this experiment, and it has plenty of firsts–my first attempt at pouring watercolor pigment onto the damp paper, my first attempt to paint equestrians, my first attempt at hounds–I guess this entire painting is a first attempt! Rough day. I got food poisoning at an Academic Decathlon event last night. Violently sick all night, and trashed out all day today. Could not even focus my eyes on a watercolor or even a good book. Hope tomorrow is better. Meanwhile, to keep my New Year Resolution of blogging art work every day, here is an old, old work of mine. The significance it has to me (for my own development) is that this is the first time I ever tried using prismacolor pencils over watercolor. All the highlights on the spruce branches are prismacolor pencil. I was also pretty new with this 300 lb. 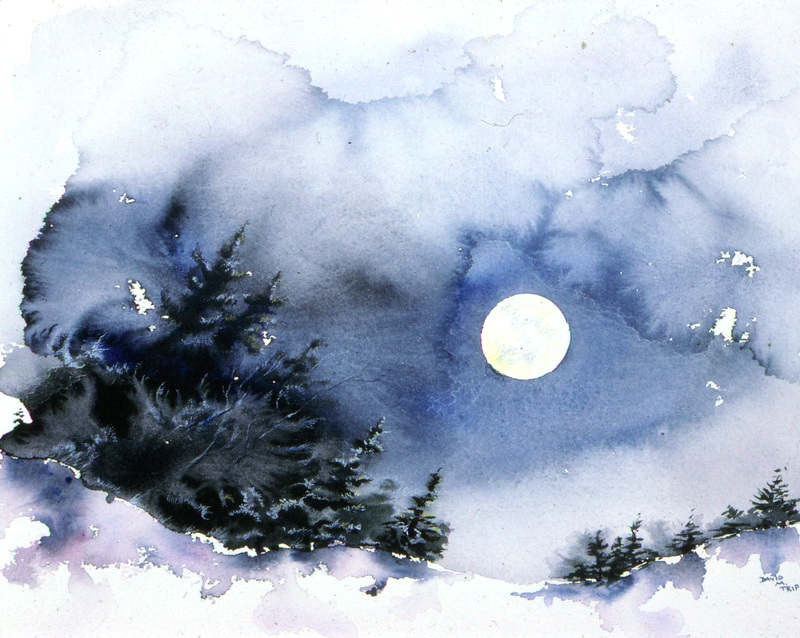 D’Arches paper, and was quite surprised to see how active the watercolor was in the night sky when I kept adding water and watching it do its magic on the page. I’m posting one of my earliest “adventurous” watercolors. This is my first train attempt, first attempt at rendering bricks, first attempt at rendering a row of shops in linear perspective, first attempt at rendering window glass reflections, first attempt at rendering broken asphalt, heck–I guess the entire composition is a first. I learned from many, many mistakes. 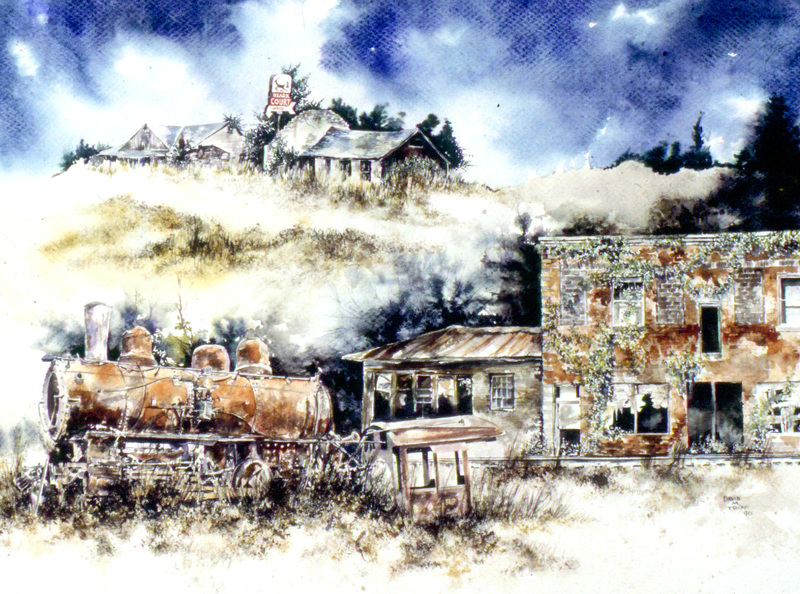 The most heartbreaking thing was painting the train first, on white paper, and seeing it “pop” out in scintillating detail, only to watch it subsequently “disappear” as I put in the background and foreground. Students daily laughed as they walked past my work station, saying, “Hey! Where’s the train? Where did it go?” I learned from this painting to leave the sky alone, if it doesn’t immediately yield what you want–don’t just keep re-doing it, darker and darker. Can’t change that. Aside from the sky and the disappearing train, I was O.K. with it, and ready to experiment further with trains. The site is Eureka, Missouri, west of St. Louis on historic Route 66. I had taken quite a few pictures of the old town’s intersections with a 35mm camera. I lifted the old “F” diesel from a magazine somewhere (I was a real railroad enthusiast). The two freight cars were two separate photos I had taken (I was shooting trains everywhere I could find them and collecting the photos in a file box). We always have more compositions in our head than we can seem to find time to commit to paintings. 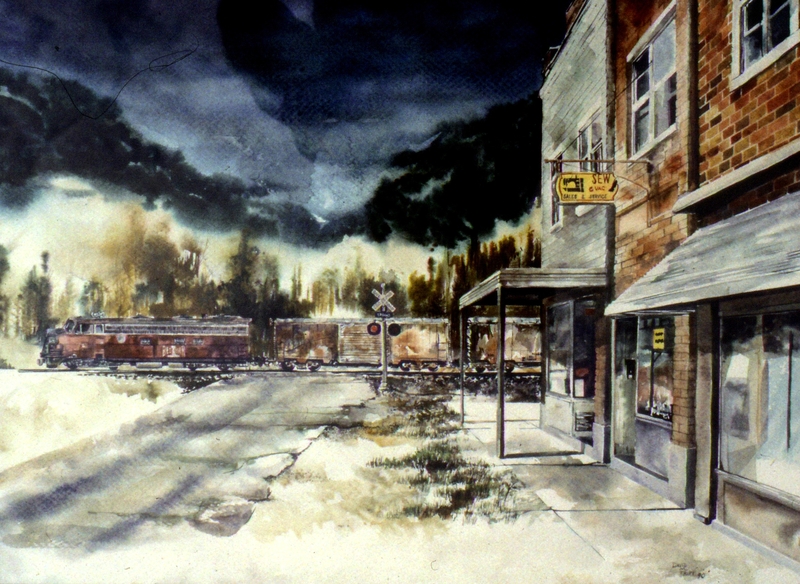 But I really wish to paint more small-town paintings such as this, with crossing trains–that is one of my favorite views and memories of growing up in Midwest America. Perhaps this will be the year that it happens. Still working on the “Hunt” scene, for anyone still curious. Trying to make the hounds look right. Will probably work on that watercolor well into tonight. Here is an old one from the files. This tavern was still standing ten years ago when I last saw it. It was situated on Old Highway 61 near Old Appleton in southeast Missouri. My father took me to this site about twenty years ago when I was out with a 35mm camera looking for nostalgic sites to paint in watercolor. I could see by Dad’s demeanor that this place held many memories for him, as he continually walked about the property and peeked in windows. He said he visited the establishment regularly during his youthful days, before shipping out to Korea, and that there was a dance hall on the second floor. I find it significant that it is located on the Blues Route, north of the Mississippi Delta. I still hope that one day, I will return to this site, and then continue southward on 61 into rural Mississippi, and see if I can continue to spot road houses, juke joints and the like. Thanks Dad, for bringing me here. Texas is expecting an arctic storm about any moment now. The temperatures dropped sharply late this afternoon (while I was out painting in the field!). Finally had to give it up. For those of you following my “Hunt” watercolor, I finally began rendering the hounds in the foreground today. Perhaps tomorrow I’ll have enough of them finished to post the picture afresh. While I painted at Lyndon Acres today, I was continually distracted by a rescued thoroughbred on the neighboring property running like the wind. He does that a lot. I used to laugh to myself every time he did it, but now it brings sad recollections to the surface. 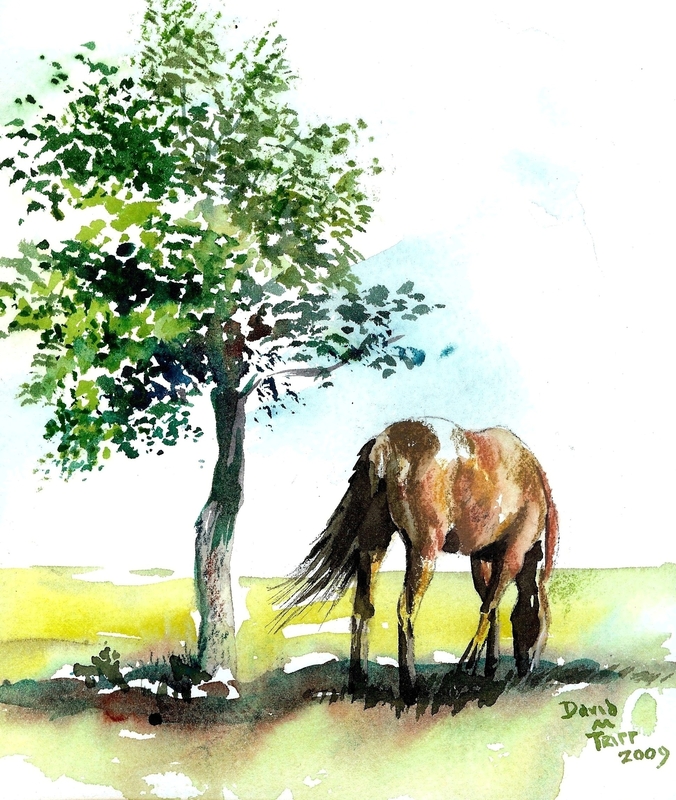 The watercolor sketch now posted is the very first time I ever attempted to render a horse in color. His name was Nocturne, a 23-year-old Welsh Cob stallion with a mane that was fairy tale-length. His black coat used to show so many amazing colors under a hot Texas sun, that I just couldn’t sketch him enough (in pencil) and photograph him. Last year Nocturne had to be euthanized. The day after he died, I went through my collection of photos, selected this one, and gave him my best shot. He was a magnificent stallion, and I miss seeing him poking his head over the fence for me to walk up and scratch his muzzle. The reason I brought up the thoroughbred next door is because of the hilarity of him racing like the wind in days gone by. Every time he passed by, Nocturne would charge the fence, arch his neck and rear and kick. Typical stallion. As if to say, “Not in my neighborhood! Stop buzzing my fence!” I always laughed at his bravado. Magnificent. I miss him. So, here’s to you, Nocturne. Thanks for the memories. 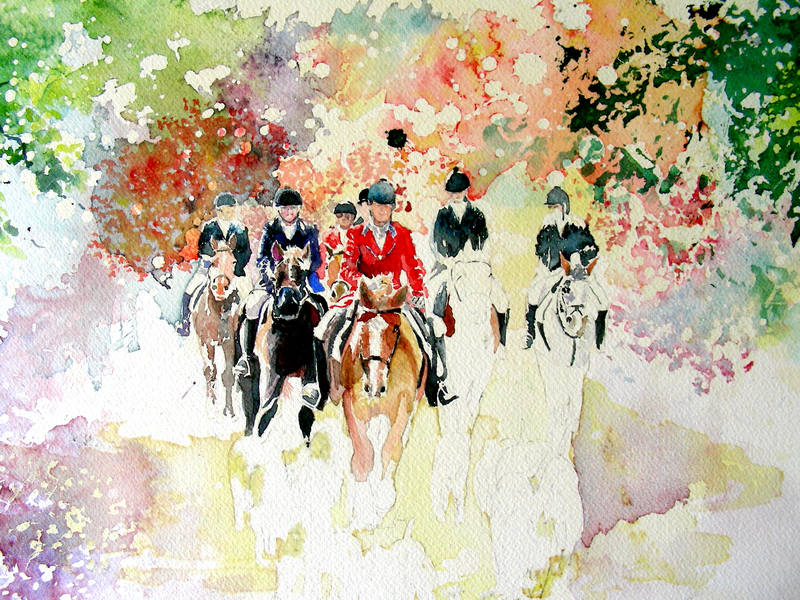 A beautiful sunwashed afternoon at Lyndon Acres, watching horses graze, my wife ride, and working on the “Hunt” watercolor (posted twice in progress). Having only rendered two more horses in the “Hunt” I’m still holding off from posting it (not different enough yet from earlier posts). So, here is one I call “Impressionist Horse.” Last year, as the sun was setting in a blaze of color, I rendered this small tree rather quickly before I lost the light. Just before the sun dipped over the rim, I threw some Alizarin Crimson into the tree shadows on the grass. After it dried I really like what I had, even though it was just a small sketch. For months I looked at it every time I plundered through my stacks of sketches and unfinished works, and really wanted to put a matt around it, but there just wasn’t enough, as far as I concerned–just a small tree and a cool shadow dynamic along the ground. 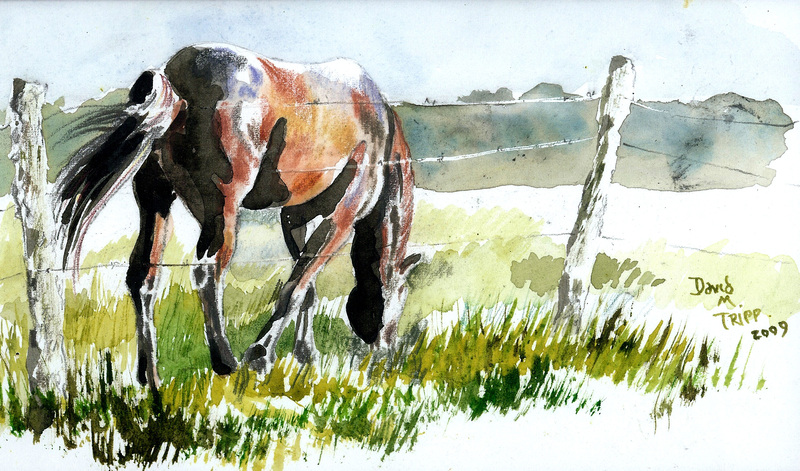 So one day, after sketching horses for about an hour at Lyndon Acres, I inserted this one into the composition. You can see through the horse literally–the colors that were on the page before I added him. But I liked the transparent effect, and liked the way the horse appeared even though (when you zoom in, you can see) there was very little color on him and even less detail. Just a ghostly sketch of a horse. Maybe by tomorrow I can post the “Hunt” picture. I just can’t seem to push it very far at a time, what with all the courses I’m teaching. There is so little quality time in the day (and night) to get art work completed. Even now I have a pile of work left for tomorrow’s Advanced Placement Art History, and it’s nearing 8:00. So, until tomorrow–hope you enjoy this one. And thanks for looking–thanks even more for all your gracious comments of support. 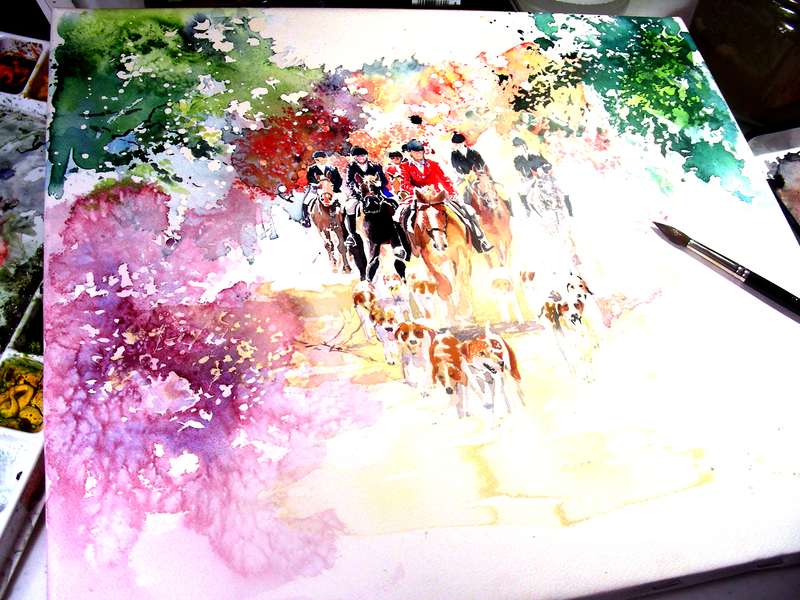 Yesterday I posted my newest watercolor in progress “Jennifer in the Hunt.” Since today I had Jury Duty, I only have had time to render one more horse in that painting. I didn’t see that as sufficient work to re-post the picture. I’ll wait for more progress before I present that one again. So . 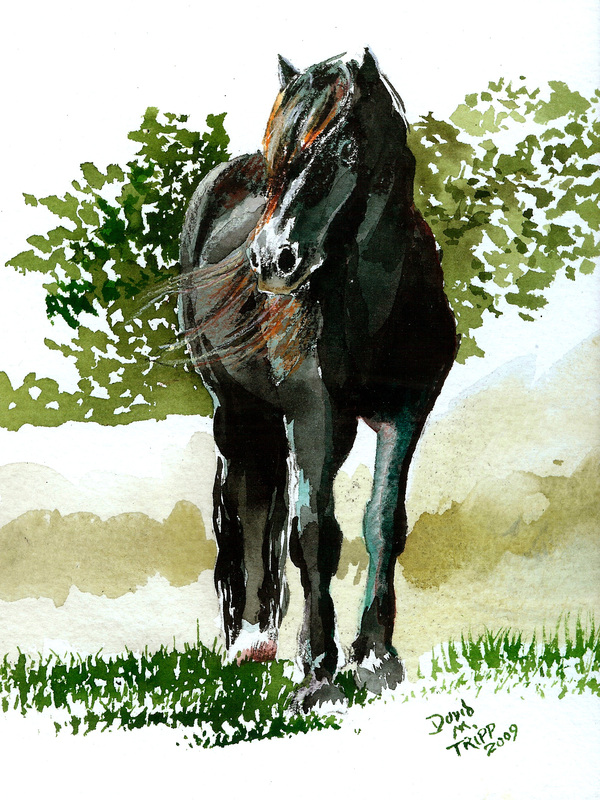 . . here is one of my earliest attempts to watercolor-sketch a horse. I wish to develop skill in rendering horses—such beautiful creatures. My wife rides, so I am around horses much more lately, but have trouble fighting back the insecurities. After all, this is Texas—and any tree shaken will dislodge a dozen excellent equine artists. However, I’m going to enter that zone and do what I can. I titled this one “Idyllic Pastures” because the sun was getting low, and I was fascinated with the play of light off the beautiful coats of the grazing horses. Not feeling competent with the watercolor, I put plenty of drawing into this one, with graphite and water-soluble graphite, as well as watercolor pencils. A few touches of Winsor & Newton watercolor pigments were applied as well. I was happy with the overall result, and did a few more. I’ll post those at a later date (maybe as soon as tomorrow if I don’t make more progress on “Jennifer in the Hunt”). What a spectacular day to be outside for painting. Lynda Lewis makes me feel welcome painting under the trees at Lyndon Acres in Burleson while my wife rides. This painting I started before Christmas, but then got cold feet and let it lay dormant a few weeks (however, it continued to compost in my mind). I’m completely out of my comfort zone here. I’m pouring watercolors for the first time in my life, and painting with a limited palette of pure pigments instead of earth tones. I have very limited experience in painting horses (about 4-5 watercolor sketches in my entire life) and have never painted hounds (which will eventually materialize in the foreground). The colors are brighter than I am used to, but I’m enjoying the blaze before my eyes. I’m spending much more time studying the photographs given to me by Jennifer Stewart (who created and maintains my website), beautiful photos taken by her husband. I appreciate so much her contribution to this new adventure, and am looking forward to seeing where it will take me. I still have a long way to go before I can get closure on this one, but at least I’m having fun. I have returned to my Grandmother McNeely’s farmhouse so many times, that I feel an affinity with Andrew Wyeth’s obsession with Kuerner’s Farm and the Olson Place. I spent summers here and holiday vacations. I still miss the old place with its sights and smells. This is one of my watercolor studies of the back of her house after the back porch had been removed. 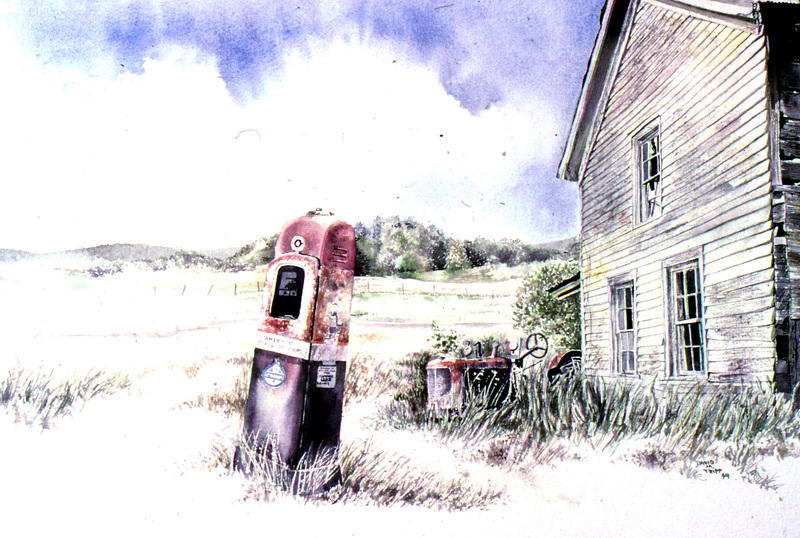 The gas pump and tractor I added from photos I had taken of such subjects in other similar settings. The old house is in rural Jackson, Missouri not far from the Mississippi River. The gas pump and tractor were photographed in rural Texas locations. I’ve received favorable comments on my compositions arranged from various sites and photographs. This one is comparatively clumsy, and it precedes the one I posted two days ago. In fact it is one of my first “composites.” The hotel is along historic Route 66, west of St. Louis. It no longer stands–even the sign has been removed. I looked at that place for twenty years on my travels back and forth between Fort Worth, Texas and St. Louis, Missouri. I’ve watercolored the hotel several times, and may post some other renderings of it in the future. The derelict brick building covered in growth was my Uncle “Jug’s” tavern called Riverview Inn. It faced the Mississsippi River front at Neely’s Landing in southeast Missouri. The tavern was backed up against a limestone cliff, and the cooler room where beer was stored was actually a hollowed-out cave in the face of the cliff. The building had no back wall of its own–it was the stone bluff itself. Of course the building is gone now. My uncle has been dead for decades, and the river flooded it enough times that it finally came down. But everytime I look at this painting, I still smell the stale cigarette smoke and the beer, and remember the blinking lights and bells sounding from the miniature bowling lane that operated when you put dimes in the vender. I spent many a night on the Mississippi River dike across the railroad tracks from my uncle’s tavern, fishing for catfish and alligator gar. Occasionally I would cross the tracks for Cokes, candy, popcorn, and to listen for a few moment’s to one of my other uncles playing steel guitar in the band that played there every weekend (first time I heard “Your Cheatin’ Heart”). I don’t know what the liquor laws were, back in those days, but the remoteness of Neely’s Landing guaranteed that the music would go on and the beer would continue to pour long past 2:00 a.m. I know that because I always fished the river till the sun came up, and sometimes the last of the cars would be leaving about then. Because of the railroad tracks that were there, and because Neely’s Landing is probably now completely gone, I chose to add a switcher locomotive I found at an abandoned mine in Pacific, Missouri. So–the hotel from Route 66, the switcher from Pacific and my uncle’s tavern from southeast Missouri combined for one of my first attempts at creating a fictional environment. I don’t find this composition as convincing as my later work, but at least it marks for me an early attempt at creating a space that could appear to the casual viewer as real. Thank you for pausing to look. Oh! One more thing! 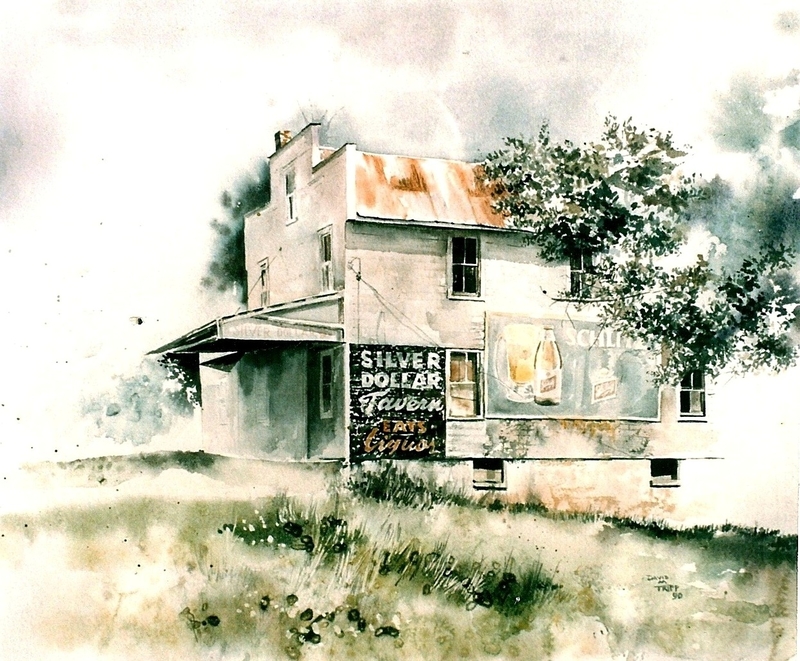 For any of you who have been following my recent blog entries, I just looked at this watercolor, and there is something else–my uncle’s tavern has a wing attached to it in this picture. It doesn’t belong there. If you will look, you will find this wing attached as a front porch to an old two-story house in my entry about my “First Gallery Sale.” The house near Union, Missouri. The wing attached to this tavern actually was the front porch of that house inUnion. So–this picture combines Route 66, Pacific, Neely’s Landing, and Union.